“‘You think you so cute!’ I swung at her and missed, hitting Pecola in the face. Furious at my clumsiness, I threw my notebook at her, but it caught her in the small of her velvet back, for she had turned and was flying across the street against traffic. Safe on the other side, she screamed at us, ‘I am cute! And you ugly! Black and ugly black e mos. I am cute’”(Morrison 73). “We were sinking under the wisdom, accuracy, and relevance of Maureen’s last words. If she was cute – and if anything could be believed, she was – then we were not. And what did that mean? We were lesser. Nicer, brighter, but still lesser” (Morrison 74). Of course many of you will recognize this excerpt from Toni Morrison’s The Bluest Eye. It’s the frequently anthologized scene, sometimes referred to as “The Coming of Maureen Peale.” I believe this scene from literature really illustrates my conceptualization of cuteness as a racial rhetoric. 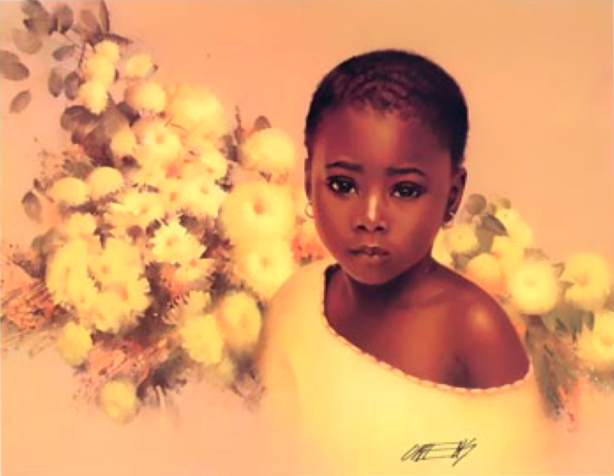 A desperate chain of events ensues because of Pecola’s wish for her eyes to magically turn blue like Shirley Temple and the white baby dolls molded in the screen idol’s image. And, along with Claudia and Frieda, having to constantly hear all the surrounding adults describe the little white girls as perfectly lovely, the fragile Pecola is pushed to the breaking point. The arrival of the wealthier and lighter skinned Maureen Peale exacerbates the situation because of the way she is shown favoritism by the teachers and parents in Morrison’s semi-autobiolgraphical Ohio community in which the novel is set. The girls in the schoolyard are stunned when the favored newcomer proudly and maliciously asserts the ostensible fact that she is cute and they are not. My dissertation is about how, similarly to Toni Morrison, this issue of “cuteness” served as productive motivation for Carl Owens and other African American artists of that generation. Owens was an African American artist and illustrator, known for a certain genre of printed paintings. I think of his most famous image “Little Flower” as the epitome of cute kitten blackness. That the above image could be viewed as agitprop is not necessarily problematic for me. At least not, if we think about agitprop in a nuanced and more complicated way.